We’re extremely thrilled to introduce you to our new Dashboard! The Dashboard is a new way to interact with Travis CI. It’s your personal, central starting point where you see all of the repositories you have access to at a glance. For each repository you can see the build status of the last build that ran on the default branch and the status of the last overall build for that repository (excluding PR builds). In the dropdown, you have direct access to the repository’s settings page and you can trigger a new API build on the default branch with a single click. Have a lot of repositories but only really care for a few? You can star repositories which then appear in the starring section at the top of the page. How to get it? Welcome beta features! You can use the Dashboard right now! Today we’re also introducing a new way for you to test new features we’re preparing for you early on: the beta features page! Go to your profile page and look for the link right under your user account. Once you’re there flip the switch to enable the Dashboard (This way you can also switch it off again). There is no immediate redirect after enabling the Dashboard but a click on the Travis CI logo at the top gets you there! We also put some fun features in there for you so you can practise your switch flipping skills. The Dashboard has come a long way! It was in the works for almost two years and is now ready for you to use. The entire UI has changed since its initial version (in case you were wondering what we worked on in the meantime). Fun fact: the first iteration of the Dashboard was the first feature I worked on when I joined the Travis CI team in January 2015. One of the things you’ll notice is that together with the Dashboard we removed the sidebar. The sidebar was the only way you could switch between your repositories and (on our .com platform) see what builds are queued and running. This functionality will not be lost but instead move to other places in future versions. Stay tuned! As already mentioned, we’ll add an overview of your queued and running builds and we have more exciting plans for the Dashboard in the making. So if you’re not quite as much into the Dashboard right now as we are, that’s fine. Check back in a few weeks to see what has changed. We will also announce bigger changes here on the blog. Can I tell you how I feel about it? 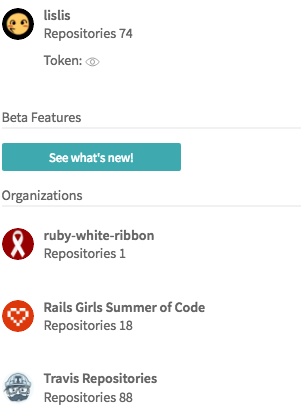 In fact, we now have a dedicated repository for beta features with tickets to discuss each feature with our users. That means with you! You can find the issue concerning the Dashboard here, in travis-ci/beta-features. Have fun with the new Dashboard and tell us how you like it!